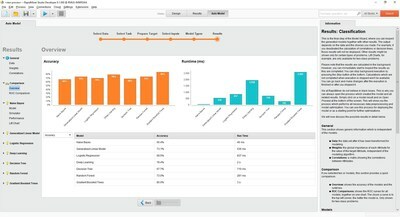 BOSTON, Feb. 7, 2018 /PRNewswire/ -- RapidMiner™, the company that delivers real data science, fast and simple, today announced the immediate availability of RapidMiner 8.1 and RapidMiner Auto Model, a new addition to RapidMiner Studio that accelerates everything data scientists do when building machine learning models. RapidMiner Auto Model accelerates everything data scientists do when building machine learning models. RapidMiner Auto Model accelerates the entire data science lifecycle using automated machine learning. "Automated machine learning promised data scientists a better, faster way to build models, but the reality never matched the hype," said Dr. Ingo Mierswa, founder and president of RapidMiner. "Today that changes with the release of RapidMiner Auto Model. When I looked closely at automated machine learning solutions, I found them to be black boxes. They restricted my ability as a data scientist to understand how the models worked and tune them when necessary. That's reckless and sometimes, even dangerous. 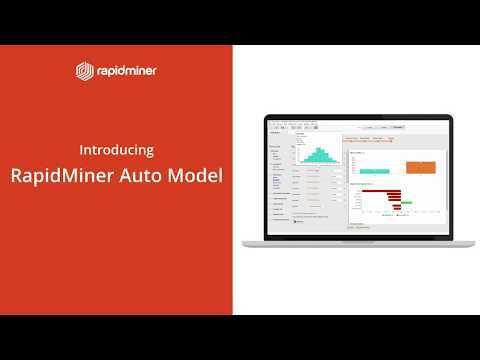 We built Auto Model on top of RapidMiner Studio to improve the productivity of data scientists without hiding the ability to understand how and why a model works. As data scientists need to tune or tweak models, they have the full power of the RapidMiner Studio visual workflow designer at their disposal." RapidMiner Auto Model accelerates the entire data science lifecycle using automated machine learning. It speeds data prep by analyzing data to identify common quality problems. It automates predictive modeling by suggesting the best machine learning techniques and then generating optimized, cross-validated predictive models. Auto Model highlights which features have the greatest impact on the desired business objective, highlighting the most important influence factors and correlations. Built in visualizations and an interactive model simulator let data scientists quickly explore the model to see how it performs under a variety of conditions. Unlike existing automated machine learning approaches, Auto Model is not a "black box" that prevents data scientists from understanding how the model works. RapidMiner Auto Model generates a RapidMiner Studio process behind the scenes, where data scientists can instantly visualize the end-to-end data prep and modeling steps, and selectively fine tune and test models before putting them into production. To learn more about Auto Model, RapidMiner Founder and President Dr. Ingo Mierswa will be delivering an introductory webinar on Wednesday, February 21st. Support for the MapR Converged Data Platform. RapidMiner Radoop and the MapR Converged Data Platform now work together to make big data accessible for data scientists who don't want to code on Hadoop and Spark. Global search. Users can now quickly find anything inside RapidMiner Studio, including processes, models, operators, and extensions. Improved performance. A number of operators have been re-factored to improve performance by 10x or more. To learn more about what's new in RapidMiner 8.1, visit rapidminer.com.